Product prices and availability are accurate as of 2019-04-19 05:16:41 UTC and are subject to change. Any price and availability information displayed on http://www.amazon.com/ at the time of purchase will apply to the purchase of this product. modelcars is proud to stock this Revell 1:24 '70 Dodge Challenger 2 'N 1 by Revell. 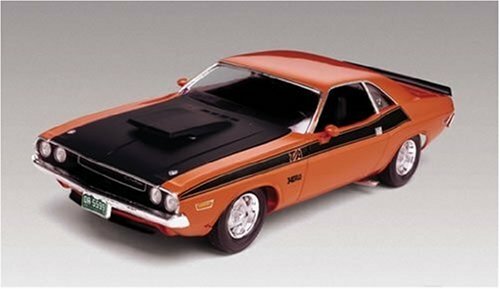 Buy this favorite Revell 1:24 '70 Dodge Challenger 2 'N 1 made by Revell and listed by ModelCars.us. This well reviewed product is currently ready to ship - purchase securely and safely on modelcars today. 132578 Features: -Dodge challenger 2 in 1. -Build two versions-factory stock or street machine. -Optional hood with high rise intake, rear spoiler, custom graphics and wheels. -Highly detailed interior. Product Type: -Hobby / Model Kits. Vehicle Type: -Cars. Color: -Multi-Colored. Color: -Orange. Age Range: -8 to 11 Years. Generic Dimensions: -4.3" H x 7" W x 9" D, 0.8 lb. Dimensions: Overall Height - Top to Bottom: -4.3 Inches. Overall Width - Side to Side: -7 Inches. Overall Depth - Front to Back: -9 Inches. Overall Product Weight: -0.8 Pounds.